Are you looking for a plant caddy or plant stand with high quality? Are you looking for a plant caddy or plant stand which can be use indoor and also outdoor? Are you tired of moving the plant hardly? CERBIOR Pot Mover(plant caddy , plant stand ) will be your best choice! Our Plant Caddy is made from engieered wood plastic resin that will fit anywhere in your home. 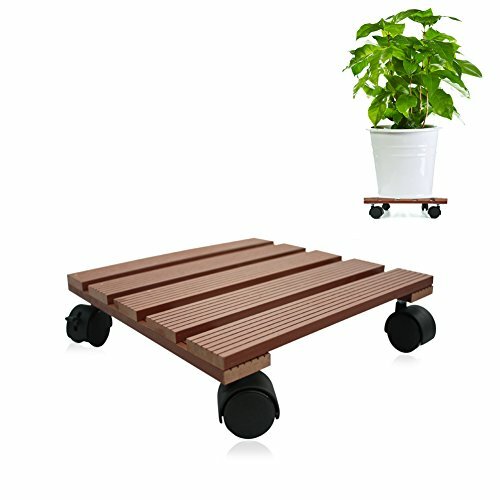 With lockable caster wheels 360-degree solid construction, it allows you to easily and safely reposition pot plants in your backyard or balcony without heavy lifting. Wood-Poly Composite Round Pot caddy is a modern and stylish way to display your pots and protect surfaces from scratches and stains at the same time. With its strong and sturdy design, you can reduce heavy lifting as it allows you to easily and safely reposition your potted plants indoors or outdoors. Purchase this handy Plant Caddy Now, CERBIOR tools make your life easier! REDUCES HEAVY LIFTING WITH EASY TURN AND LOCKING WHEELS - With lockable caster wheels 360-degree solid construction. The easy to turn wheels provide easy glide when move a heavy plant and makes moving around very convenient. It allows you to easily and safely re-position pot plants in your backyard or balcony without any heavy lifting. DURABILITY AND LONG LIFE- This Wood-Poly Composite Square Pot caddy protects surfaces from scratches and stains at the same time. MODERN AND STYLISH - Our Plant Caddy is made from engieered wood plastic resin that will fit anywhere in your home, indoors or outdoors. SATISFACTION GUARANTEE - Our Wood-Poly Caddy is SATISFACTION GUARANTEED, backed by a manufacturer 30 days money back guarantee, you can buy with confidence from Cerbior. If you have any questions about this product by CERBIOR, contact us by completing and submitting the form below. If you are looking for a specif part number, please include it with your message.